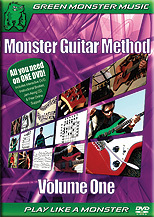 Monster Guitar Method Volume One is perfect for guitar players who are just starting out. You'll learn how to find any note on the fretboard without the using a chart; major and minor scales; the minor pentatonic and blues scales; major, minor, dominant seventh, and power chords; rhythmic notation; strumming patterns; and much more! Also included are an instructional booklet and jam-along CD to practice the lessons from the DVD.